"There are no good books for boys." This was a statement I heard several times at a party this weekend. 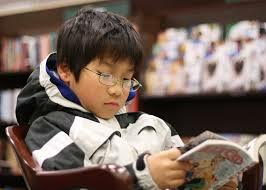 Apparently I'm not the only one saddened by a child who doesn't read a lot at home. The usual series titles came up. I won't mention the writers or the books, but the problem was, according to these moms, that the books aren't written very well. I'm talking about extremely popular series shelved in every Barnes and Noble. Series that have 20 + titles are, according to my friends, to be formulaic and boring. Only Harry Potter and The Wimpy Kid books passed the test. With those 'famous' series brushed aside, I really had to reach to think of good books for kids, boys in particular. I used to love the Oz books, although they're female-centric. However, there were a few later books (such as the ones written by Baum's niece, Ruth) featuring very realistic boys. My favorite was Kabumpo in Oz. 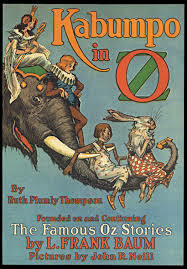 If you like retro stories with funny characters and exciting fantasy, I highly recommend old Kabumpo - who's an elephant, if you're interested. Another set of books I read and reread was The Melendy Quartet. Again, this is a dated series. However, the characters are so real and funny they jump right off the page. I loved Randy and her brothers, Rush and Oliver. Even Mona, the glamorous actress sister, was flawed and completely lovable. The fourth book, Spiderweb for Two, is a long series of clues in a mystery solved by Randy and Oliver over the course of a school year. My sister and I adored the C. S. Lewis books, but both boys had already read them. An alternative is the Victorian author E. Nesbit. 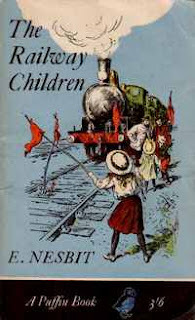 Her books, especially The Story of the Amulet and The Railway Children, include exciting adventures and naughty, lovable kids who encounter magic and mayhem in universes Nesbit brought to life. If you prefer more realistic stories, The Railway Children is about a family who has to face life after something terrible happens to the father. I won't say what it is, but it's something a lot of present-day kids have to confront each day. TRC does so in a lovely, sad-but-funny, angsty slow burn that leaves me teary each time, in a good way. My final recommendation is The Sword in The Stone by T. H. White. Although the series gets very adult in the later books, TSITS is all about young Arthur and his adventures with different animals and people, all under the aegis of the wizard Merlin. There are kings and dogs and dragons, and it's a wild ride. Now, please, if you have some suggestions put them in the comments! I'll pass them along to my friends and their sons. I have several suggestions for you to consider. These are excellent - thank you! I really enjoyed Knightley & Son by Rohan Gavin. I just finished Warren the 13th and the All Seeing Eye and it was a fun read. My nephew really liked the Huber Hill series by B.K. Bostick. Are blog tours worth doing?